The ghost of Lukas Rosal was haning heavy over center court this mornig as In an amazing turn of events one of the greatest tennis players in history has been bounced out of Wimbledon for a second year in a row. This time Rafael Nadal’s loss came at the hands of Steve Darcis from Belgium who ranks #135 in the world. This time he lost in straight sets and not in 5 like 2012. This year it was played outdoor which favors Rafa instead of a closed roof which may have given Rosal an edge. 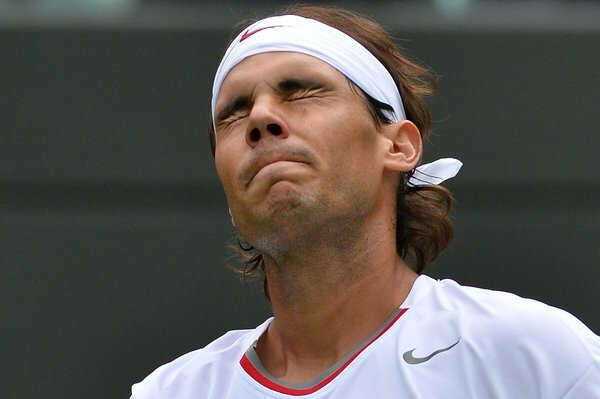 This is Nadal’s first ever loss in the first round of a Grand Slam. Ever. The match only lasted 2 hours and 54 minutes which is short by epic Nadal Djokovic standards but Rafa was clearly unable to do many typical shots and chase down balls as he is known for. His knee started showing real signs of wear in the 2nd set and Rafa ran around his backhand like a dog around a fire hydrant. Having trained very little for Wimbledon after his grueling and successful clay campaign, the mighty spin master was uncomfortable on the surface. Steve Darcis talks to the press after his magnificent first round win over Rafael Nadal at Wimbledon 2013.